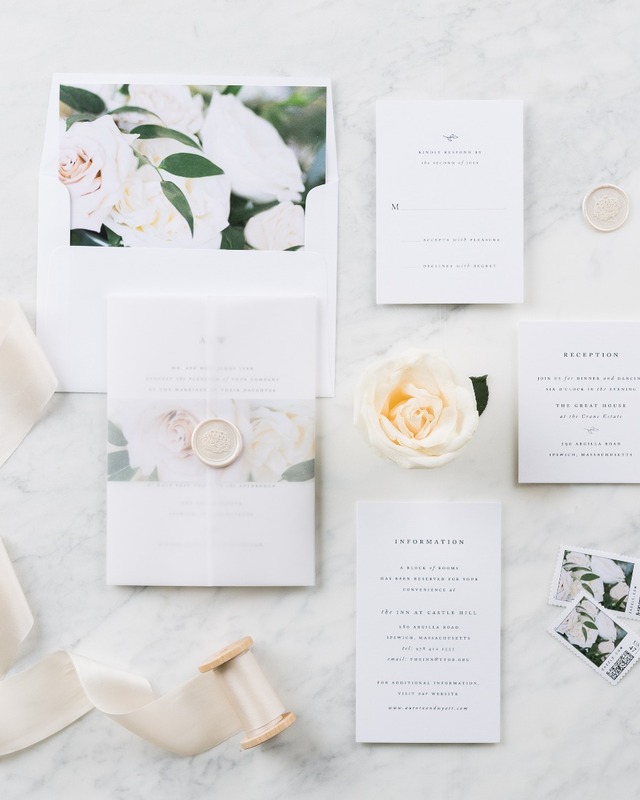 Your invitation suite says a lot about your wedding day, so set the right tone with the sweet and sophisticated look of the new Aurora Floral Invitation Suite from Shine Wedding. This brand new design for 2018 features carefully arranged floral accents for a light and airy feel perfect for an elegant wedding. In fact, there are twelve new floral designs to choose from so you can easily customize to match your wedding florals. A vellum jacket, secured with a wax seal in your choice of color and floral belly band ties it all together beautifully. Your guest's jaws will hit the floor when they open this gorgeous suite! Shine Wedding also offers guest addressing and return addressing services, so you don’t have to write and rewrite addresses over and over again. Your invites will have a clean polished look when they arrive at their destination. Best of all? You can utilize the time saved on more important things for your big day, like wedding dress shopping! Shop now. All together this suite includes the personalized invitation, inner/outer envelope for extra protection, vellum jacket, wax seal, floral envelope liner, and floral stamp designs, which are available in small, medium, and large sizes (postage sold separately). Want to add that extra special touch? You can also include floral belly bands, 100% silk charmeuse ribbon, and response cards to complete your suite. So what are you waiting for? 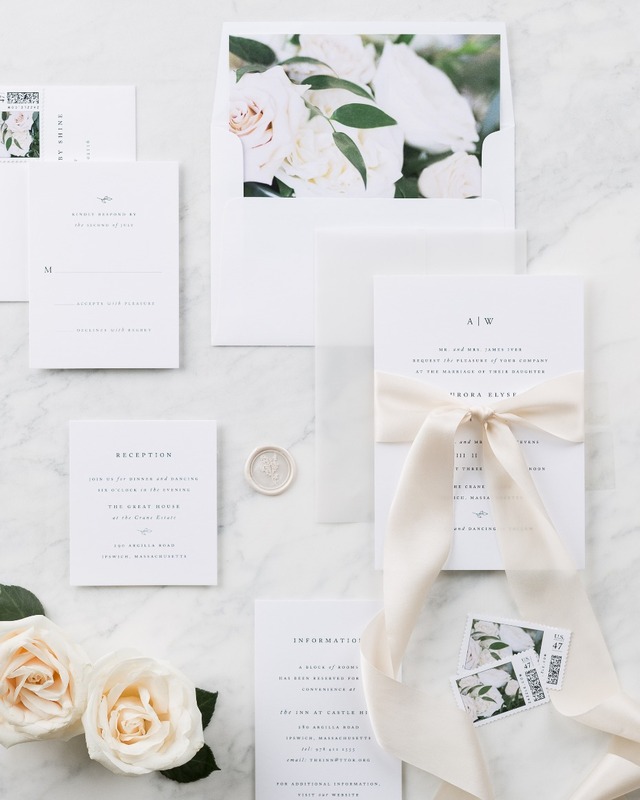 Shop now to customize your invite and see all the stylish options Shine Wedding has to offer. 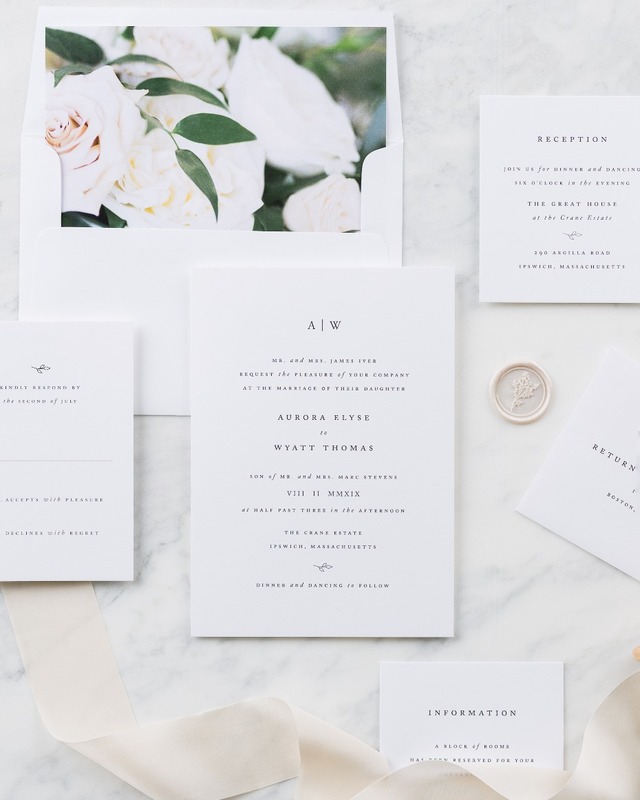 We partnered with Shine Wedding to share with you their beautiful new Aurora invitation suite. As always, thank you for supporting our sponsors!